Sometimes you may need to monitor a directory for changes. This can be the case if it contains super-important files that no one but you should tamper with or to get information about new or modified files in a specific directory. While you may be able to monitor a folder manually if it contains a handful of files, the tasks becomes impossible for larger sets of directories and files. Enter Directory Monitor, a free program for Windows to monitor one or multiple directories. When you start the program for the first time you will see the main interface with an option to immediately add a directory for monitoring. You can either paste a folder path into the form at the top or use the folder browser to pick a directory for monitoring. 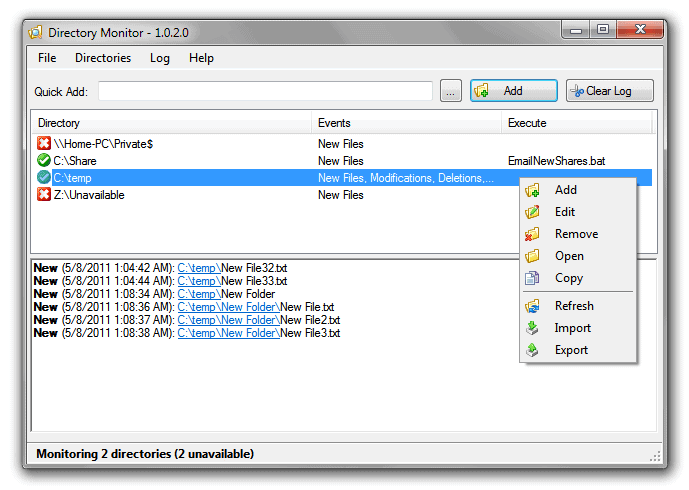 A click on Add starts the monitoring of the selected folder. All folders added this way are monitored for new file events only. A right-click on a folder opens the context menu with options to edit or delete the selected folder. The edit directory entry opens a new menu with options to change the events that the software monitors. Additional options include file modifications, deletions and renames. The program will monitor subdirectories by default, can record the user information that made the change or execute an application when a change is recognized. All changes are by default displayed in the lower half of the program window. This log can be saved, copied or cleared from the Log menu at the top. The program options and settings can be used for advanced configurations. This includes options to set global file or folder patterns that you want included or excluded. Handy if you only want to monitor document formats instead of all formats in the selected directories. The default monitoring interval is set to 180 seconds, which means that Directory Monitor will check the selected directories in that interval for changes. It is possible to decrease or increase that interval in the settings. Directory Monitor is a handy tool for Windows users. It could use notifications, sound or visual for example, to further assist and notify the user about changes made to directories that are monitored. The program requires the Microsoft .NET Framework 3.5 Service Pack 1. It can be downloaded as a normal installer, web installer or portable version without installation from the developer website. Ahh, in .NET you even have a default FileSystemWatcher class to handle such tasks. Then it is near realtime and dont need to scan the directory manually and compare with the previous scan. That would be more handy to program. can it watch sub directories as well ? Yes it can monitor subfolders. great, then i can use it to monitor the directory C:\ and find out where any file is downloaded ? Yes, but you will get a lot of noise because you will see all new file creations, not just downloads. Thanks for the review. I just want to let you know that Directory Monitor does not use polling and notifies the user of changes in real-time. The refresh interval (defaulted to 180 seconds) is just how often to check if the directory/share is still physically available and will change the icon on the left, update the status bar and notify the user accordingly. @Georgios: Not at the moment. Since DM is real-time it won’t be able to monitor unless it’s running. I am about half way through the process of saving the directory structure to file on shutdown and then diffing the changes on start-up to users can detect changes that occurred while DM was offline. This should be available in the next week or so.